This anti-aging soup is easy to prepare and packed with nutrients! Homemade bone broths contain minerals in a form the body can absorb easily—not just calcium but also magnesium, phosphorus, silicon, sulphur and trace minerals. It contains the broken down material from cartilage and tendons, substances such as chondroitin sulphates and glucosamine, now sold as expensive supplements for arthritis and joint pain. 2Gently melt coconut oil in small saucepan. Should only take 1 minute. 3Place all vegetables in roasting tray and pour coconut oil over. Add salt and pepper and place in oven to roast until soft. Approx. 45min-1hr, depending on oven and size of vegetables. 4place pumpkin seeds in oven safe pan and put in oven at the same time. Take out when lightly toasted, approx. 10-15 min. 5Remove vegetables from oven and place in small batches in the blender or Vitaprep. Each time adding 1 cup of chicken stock. Be sure to use lid for blender as ingredients will be hot. Blend until smooth and place each batch in a medium sized pot. 6Place soup on medium heat and bring to a simmer. 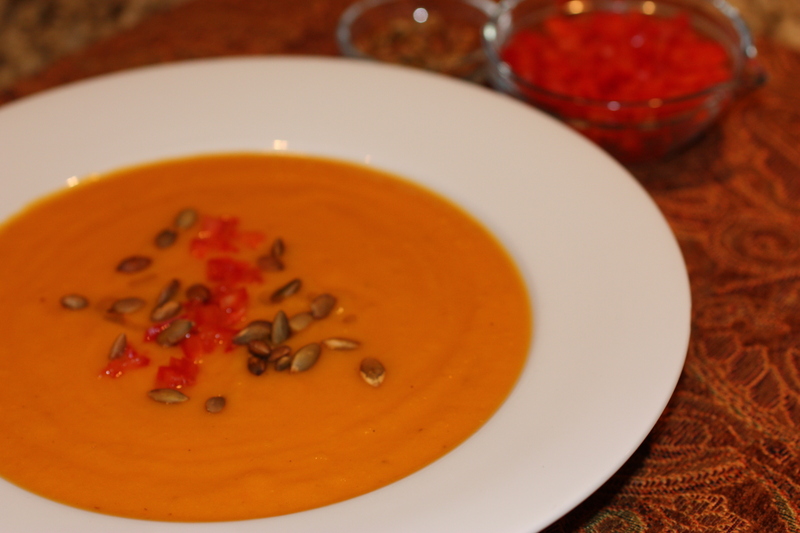 7Garnish soup with diced red pepper and toasted pumpkin seeds, and a drizzle of beautiful olive oil! 8Variations: To spice it up with some Middle Eastern flare, substitute 1 can of coconut milk for 1.5 cups of the chicken stalk and add 2 Tbsp of curry powder with turmeric to the blender. 9Also you can add some chopped kale to the vegetables 20 minutes before they are done to make the soup more nutrient dense! 1Rinse chicken carcasses. Place in a large stock pot with water. Bring to a boil and turn down immediately, or you will have a cloudy stock. 2Skim the foam off the top, this is all of the impurities in the chicken. Add apple cider vinegar. 3Place the vegetables and aromatics in the stock and bring to a rolling simmer. 4Simmer for 3 hours, uncovered. 5Take stock off and strain. Allow to cool if using later, or add to soup you are making. 6If you want some concentrated bullion cubes, use less water in the beginning, place stock back on stove after straining and simmer until reduced by 4. Take off and allow to cool. Place in ice cube trays to be frozen and added to soups as you desire. 7If pressed for time – use a slow cooker and begin stock over night or before you go to work. Follow steps 1-3, then turn to low, cover and strain when you return. The apple cider vinegar helps to extract the calcium from the bones. In addition to coconut oils’ thermogenic nature which helps to speed up the metabolism, it also helps to prevent premature aging due to its’ antioxidant properties. Speaking of antioxidants, they are natures number one anti aging remedy as they help to fight the negative affects of the oxidative stressors found in our modern day lives. Vitamins A, C, E, and Zinc are super antioxidants, and the vegetables in this recipe are full of them! Homemade soup stocks are incredibly nutrient dense foods that are alkalizing, as well as very healing to the lining of the intestines. They are also rich in collagen and gelatin which are essential for healthy bones and joints. Unlike store bought stocks that are mass produced, high in sodium and low in nutrients. With a little planning and preparing, you can enjoy this traditional food and feel nourished and proud.